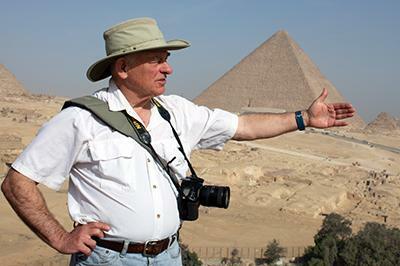 MINOT, N.D. – Minot State University is pleased to announce world-renowned Egyptologist Mark Lehner will give a lecture at Minot State’s Ann Nicole Nelson Hall Thursday, May 2. Since 2005, AERA has conducted archaeological field schools to train young Egyptian archaeologists working for the Egyptian Ministry of Antiquities at Giza, Luxor, and Memphis on behalf of the American Research Center in Egypt funded by USAID, the Charles Simonyi Fund for Arts and Sciences, and the Bill and Melinda Gates Foundation. Lehner has appeared on television in National Geographic's Explorer program and on the WGBH NOVA series, “Secrets of Lost Empires,” on ancient technology, including “This Old Pyramid and Obelisk.” In 2011, Lehner appeared in NOVA’s “Riddles of the Sphinx.” In February, he was featured on NOVA, “Decoding the Great Pyramid,” and appeared on the Science Channel’s “Unearthed: Secret History of the Sphinx.” He is author of “The Complete Pyramids,” published in 1997 by Thames and Hudson and the co-author, with Zahi Hawass, of the book “Giza and the Pyramids, the Definitive History,” which was published last fall. His work has appeared in articles in National Geographic, Smithsonian, Discover, and Archaeology.